Team SOLIDs system, burning iron powder. Credit: Bart van Overbeeke. The Dutch government informed Dutch industry in January this year that by 2022, it should quit consuming natural gas. Students from Eindhoven University of Technology are working on a sustainable solution to replace industrial fossil fuel consumption: burning iron. This fuel generates no CO2 emissions, and the residual product, rust, can be fully recycled. The iron powder flames produce high temperatures, which is important for many industries. The student team, Team SOLID, has built a proof-of-concept installation that generates both heat and electricity. This technology has the potential to become an important element in the future energy system. Excess renewable energy, generated for example by solar panels on sunny days, can be stored compactly in iron by converting rust (iron oxide) into iron. The iron can later serve as fuel, when energy is needed. The iron oxide resulting from the combustion is collected and reused. The use of iron in this system is circular, generating no waste and most importantly, no carbon dioxide. Team SOLID's system offers a solution for the first half of this circular process. It combusts iron powder and thereby generates hot water, heat and electricity. The other half of the cycle already exists: the production of iron and the recycling of rust are already part of existing industries. This part of the cycle currently runs on fossil fuels, but sustainable alternatives are being developed. In Sweden, for example, a pilot plant is being built for iron production with sustainably produced hydrogen. Iron is abundant: it is the most common element on earth. The extra costs are limited: when applied on industrial scale the fuel costs will be up to twice as high. However, the increasing costs of CO2 emissions may eventually even make it cheaper. The system of the Eindhoven students has a capacity of 20 kilowatts, which is comparable to that of a conventional central heating boiler. One of the most important advantages of the system is that it can respond quickly to a changing energy demand. Moreover, the system is relatively easy to scale up. 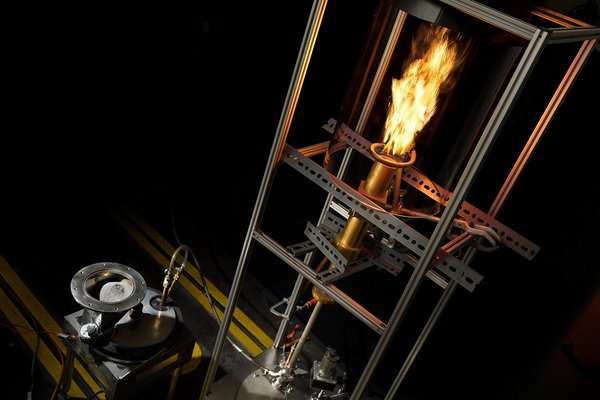 Using the heat, the system drives a Stirling engine that generates electricity. Additionally the system produces hot water and steam. The students work in close collaboration with Philip de Goey and Niels Deen, Eindhoven professors in respectively Combustion Technology and Multiphase & Reactive Flows.